The Powerplant Mantis Reflector is an upgrade from standard euro reflectors and features adjustable wings to match the footprint of the reflected light from your lamp to your grow-space and grow-style in your garden. The wings each have 5 possible positions and are adjustable separately. The wings are locked into position by clipping the wing end-stops into notches in the reflector’s frame. In the narrow position, the lighting footprint is narrowed but more intense. In the widest position, the lighting footprint is spread over a larger area. The Powerplant Mantis Reflector is designed for use with any horizontally mounted HPS or MH lamp. Simply hang the reflector over the centre of the grow-space at an appropriate height using easy rolls or jack chain. Holding your lamp with a clean cloth insert it into the E40 bulb-holder in the Diamond Reflector and screw it in very firmly. Plug the lead into an appropriate ballast for HPS/MH type bulbs or an IEE (kettle type) mains lead for fluorescent type bulbs and switch on. It is advisable to switch off your light and allow the lamp to cool down prior to adjusting either side of the Mantis in order to avoid any accidental burns or damage. When HID lamps are switched on they run extremely hot. As with all high pressure sodium and metal halide bulbs it is necessary to avoid touching the lamp with anything such as fingers or plants as this may cause severe burns or fires. In particular avoid sprays or liquids coming into contact with the lamp as this may cause premature failure or even an explosion. 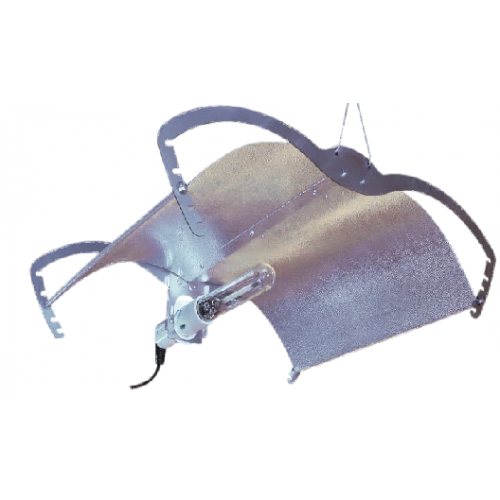 Heat shields are available in small or large, small heat shields are suitable for lamps up to 600 wa..